This release addresses multiple security issues issues and should be applied immediately to all forums running the 2.1 release branch. Fix issue where someone other than the original author could delete an activity comment. Tighten security around the database update mechanism. Close 2 potential XSS vectors. Our sincere thanks to @mtschirs and @Bleistivt for privately reporting security issues via [email protected] that allowed us to create these patches. The 2.1 branch is in maintenance mode which means it is only receiving security patches until the release of 2.2. We've released a 2.1.12p1 to address a couple PHP version requirement problems that crept into our backports. Thanks to @hgtonight for the fast identification & patches. 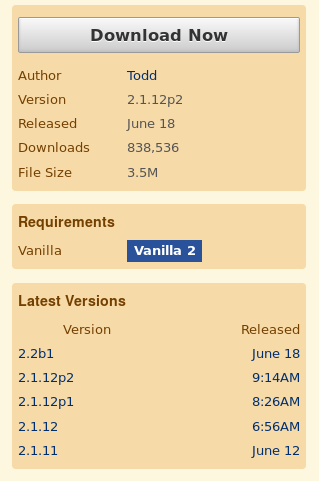 Well i updated my 2.1.11 but utility/update kept 500-ing, so did the feeds from vanillaforums in the Dashboard. So i checked the github, applied @hgtonight patches and update after that was successful and feeds on the Dashboard load fine.. So thank you @hgtonight and bad bad @vanillaforums for not testing before sending emails about applying immediate patches. @Linc or @CrazyLemon can you direct me to the specific patches you are talking about? Or will 2.1.13 be coming out to cover this? Linc or CrazyLemon can you direct me to the specific patches you are talking about? Or will 2.1.13 be coming out to cover this? There are already in the p1 package. Thats why Linc mentioned it. Got it! Thanks for clarifying @CrazyLemon. There has been a second patch with another similar PHP version fix. The link in the OP has again been amended. Apologies for the requirements flubs. @hgtonight fixed it for me. That the beta sits atop the list as "most recent" is a bug that should get addressed via the community repo, not a release discussion. the bigger bug is the Released Date for 2.1.12p2 that is 2 lines below Todd's name. it is still a bug that will confuse new users reading release notes and then looking at add-ons and wondering what gives, no matter how you decide to fix it or not fix it or ignore it. I don't recall a beta ever added to the add-ons section of core in prior releases. I could be wrong. That is the bug in the first place. The beta could have been available via github as usual instead of corrupting the add-ons. I was under the impression the add-ons section should be current with the current stable release, not for beta and alpha versions. But maybe that changed with the alpha and "betaning" (to go along with another non-existent word spacening and other argot) of the add-ons section to make it totally confusing to new users. I mis-believed github was for experimental, alpha and beta versions, not the add-ons section. Things may have changed though. If the goal is not to confuse people that one would be one way to release things if there is any desire on your part to reduce confusion. simple fix (delete beta from the core add-ons). no code needed. just logic. They have always been released via addons. No, it could not be distributed via GitHub in the same way. I don't understand the sudden exasperated snark in a release discussion about a bug that has literally always existed, but that'll be enough now. My mistake, didn't realize the bug always existed. I just noticed the issue regarding this particular vanilla core release and thought it would be confusing to new users, that is why I brought it up, but as long as you are aware, thats good enough for me as well. feel free to delete my comments or split them into oblivion. which solves the issue for any images affected. So I guess 2.1.12p3 will be released with @hgtonight's fix? So I guess 2.1.12p3 will be released with hgtonight's fix? that is the 64,000 dollar question. will the fix for pfaff's and other's reported problems be available in a 2.1.x release? at least there was an attempt to fix the first three, everyone makes mistakes. They should be applauded for trying to fix security issues with the release and to rectify php requirements with the next two patches. However, the fourth problem was reported minutes later after p2 was released, which leads to your as yet unanswered question. perhaps not. It was a "regression" bug. but the announcement says only security bugs will be fixed in the future. there are several rules at play. thou shall not modify core. the beta version is for test purposes but doesn't have security fixes. So does the patch reintroduce the problem that security fix was supposed to fix and should people change the core, or should they wait until 2.2 is stable with security fixes or should they one by one manually change the core after a upgrade to 2.1.12p2? Images not displaying as they did prior to upgrade. (ever wonder why the wolves are at the doorstep).